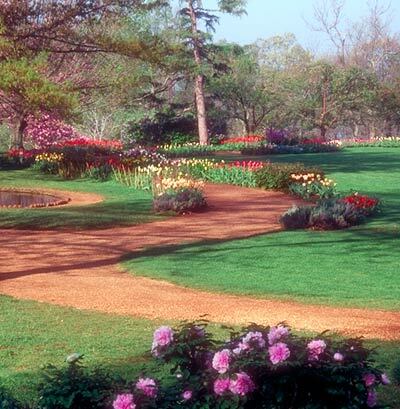 Many Americans are mixed up when it comes to their home landscapes. Too often we put all the emphasis on an attractive border across the front and give scant (if any) attention to the patio. Little wonder the back 40 is rarely used. Ideally, house and garden ought to be of one piece, with windows framing views and doors opening into al fresco “rooms” as appealing in their natural way as those under the roof. Our landscapes should be a part of – not walled off from – our interiors. 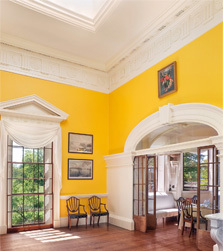 Thomas Jefferson can inspire us in domestic design. 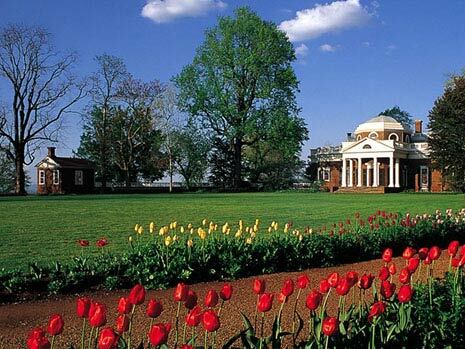 He was ahead of his time in creating Monticello, the elegant, hilltop mansion that invited the outside in. It’s been about 20 years since I last visited, but some impressions remain fresh. Where others of his day and ours put all the emphasis on decorating interiors to wow visitors and make themselves feel good, Jefferson looked beyond the walls literally. For instance, the tea room on the west side of the house probably cost a king’s ransom in the amount of glass used. Those windows were a luxury, yes, but the mountain view to the west is spectacular. No doubt sunlight pouring in during winter was almost as welcome as the scenery. Few homes boast such vast, magnificent vistas, but that doesn’t mean we can’t have something lovely to look upon outside a window or patio doors. A variety of landscape elements, from fountains and bird baths, to specimen plants and sculpture, can be framed by a window. This is especially important for windows we frequently gaze through, such as the one over the kitchen sink. The greenhouse that opens off his study is an early version of a three-season room. Nothing wrong with copying this, except you probably should plan on heat to make it a four-season room. Walls of glass that protect tropical plants and offer views of a pleasing natural scene beyond will tempt you out of the house year around. Sunny winter days spent in such confines make that long, difficult season much easier to bear. This I know to be true. At my house, a tiny enclosed porch with large windows faces south. Napping there on a winter afternoon is a delight. The garden beyond was planted to become a living landscape mural with visual appeal in all seasons. He welcomed natural light and imported the concept of skylights, a new architectural device he saw in France. The soft, diffuse natural light flatters everything it touches and cuts lighting costs, whether it be candles or electric bulbs. One can imagine string quartets playing Mozart and guests in silky finery gliding from inside to outside, laughter and music mingling with the fragrance of flowers on a summer breeze. Your backyard may never equal this, but creating appealing outdoor space will enhance your life each day your are at home. For more, please visit Monticello’s website. Photos included with permission and copyright of the Thomas Jefferson Foundation at Monticello. So, your kind neighbor calls to offer some free plants. Do you accept willingly? Well, that depends. Many well-intentioned gardeners like to share their plants, but often their plants can be more of a nuisance than a blessing as they proliferate and crowd out the other plants in your garden. Pretty soon, all you have is a garden of neighbor’s lovely gift. Aggressive Plants ­– Many of these plants can be planted in an area where they are contained or where an area needs filled. For example, I grow mint in a container and plant cleome in a bed where I can easily thin the abundance of new seedlings that return each year from this self-sower. Bachelor button (Centaurea montana): I gained my first bachelor button at a plant swap. I love the cottage look this plant brings to the garden but get frustrated by having to pull an abundance of new plants that emerge in many unwanted spaces. 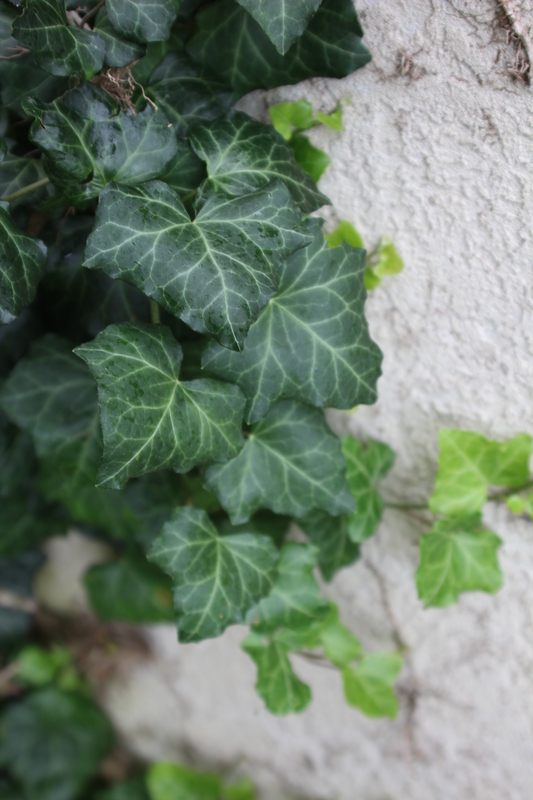 English Ivy (Hedera helix): This gifted plant has taken over many of my perennials including my beloved Lady’s Mantle. Good alternatives to this vine are sweet woodruff, wild ginger and wood aster (Eurybia divaricata). Mint (Mentha): Mint’s great to have on hand to add to tea and mojitos, but its roots send up unwanted shoots if not kept in a container. Passion flower (Passiflora incarnata): My husband was drawn to the amazing blooms on this vine, but its aggressive nature has become a bane in our garden. Planted along our garden fences, the vine’s spreading roots send up new shoots throughout the garden, and these new vines rapidly take over if not pulled. 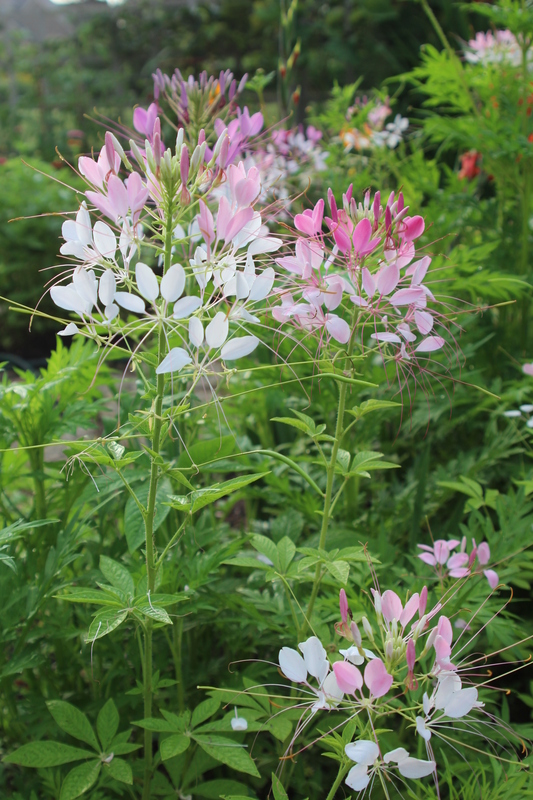 Spider Flower (Cleome): These big spider-shaped blooms are followed by seed pods loaded with lots of seeds. I plant them in a cutting garden but ruthlessly thin the new seedlings. 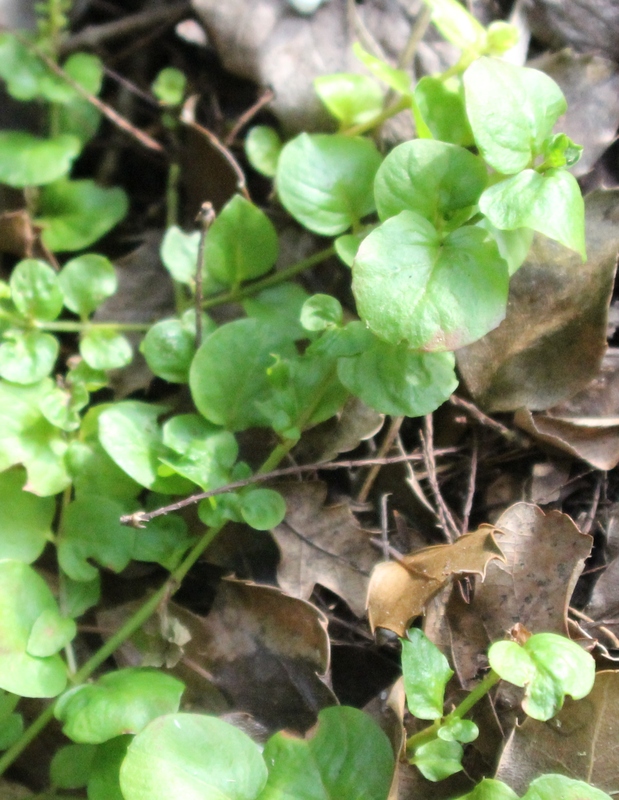 Creeping Jenny (Lysimachia nummularia): I innocently planted this “spiller” in a container garden and found it jumped to a nearby bed where it quickly spread. Invasive plants – Several plants are listed as “invasive” in that they threaten other native plants in natural areas. 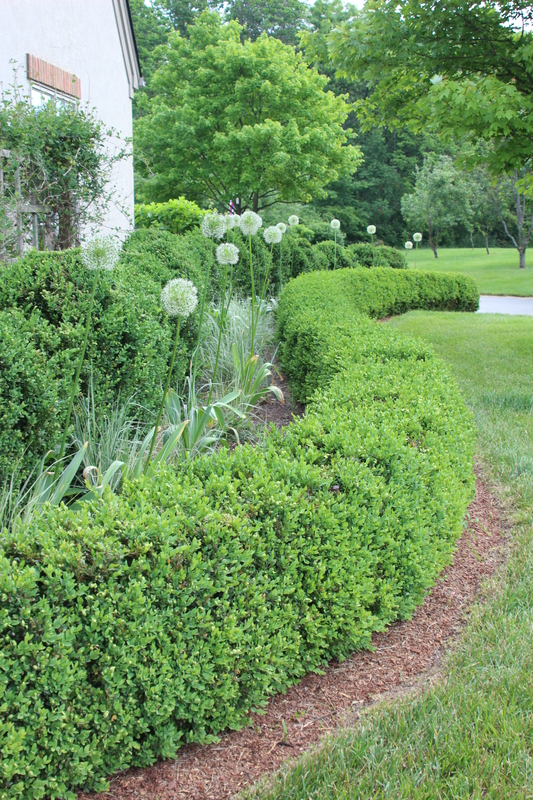 Environmentally responsible gardeners should keep these harmful plants from their landscape. 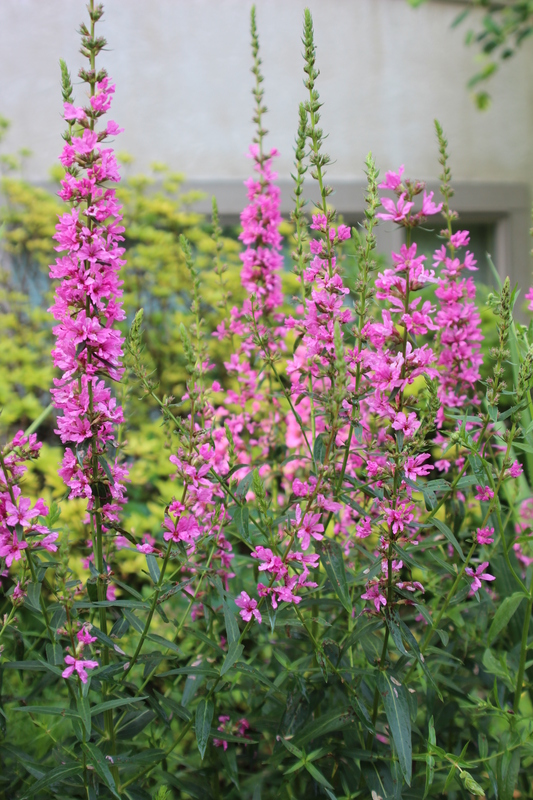 Purple loosestrife (Lythrum salicariaand its cultivars and hybrids): This popular magenta-spiked garden flower grows three to seven feet tall and has a dense bushy growth of one to 50 stems. Purple loosestrife spreads aggressively by underground stems (rhizomes) and can produce as many as a million seeds per plant. Supposedly sterile strains of L. virgatum will outcross with this plant and produce seeds. Lesser celladine (Ranunculus ficaria): This buttercup-like plant forms a green mat and chokes out other spring wildflowers. And it leaves behind small tubers when you pull it from the soil which explains its masses of plants. 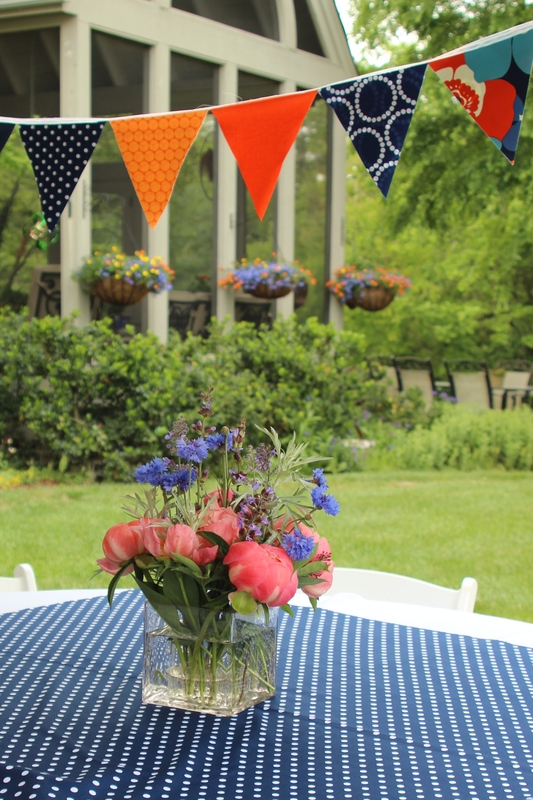 For the privileged few, prepping for a backyard party simply means giving instructions to the gardener, chatting about menus with the cook and planning a sweeping entrance at party time worthy of a Fred Astaire and Ginger Rogers movie. The rest us simply assume all duties of the ever-toiling staff at Downton Abbey. While I can’t advise on canapés and cocktails, you can make it seem as if a gardener (or at least landscape service) keeps up appearances. Before acting upon a single item on the following to-do list, however, make a rain plan. Midwest weather is notoriously changeable. And never forget the most important thing — people are coming to have a good time, not judge a landscape contest. Granted the guest list may include a persnickety relative or in-law, whose sole purpose is to find fault. They will succeed no matter what. Don’t sweat details. Now for those promised suggestions. Limit the party area and focus efforts there. No sense grooming each inch if only a 20-foot perimeter around patio or deck will be used. Fluff up mulch to revive color. Apply fresh mulch only if you have a week or two to allow the odor to dissipate. Never have more than 2 inches on the ground. 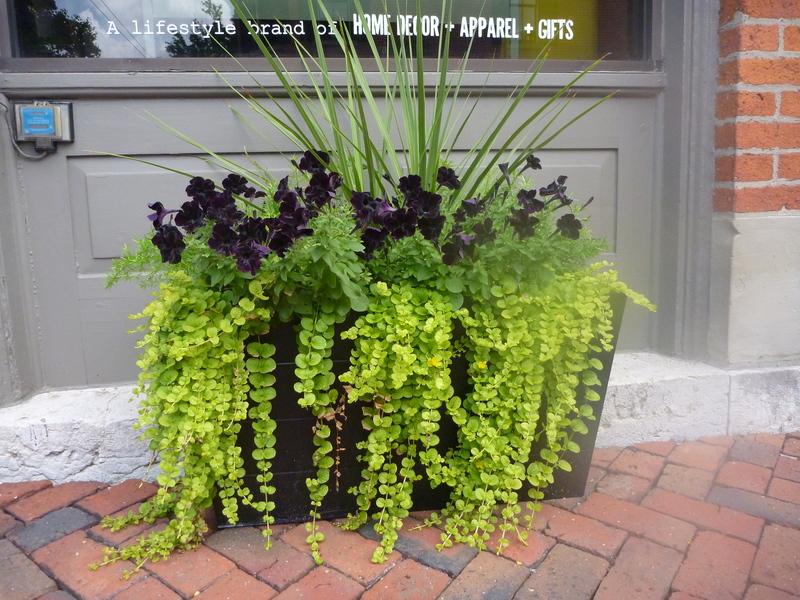 Remove yellow leaves unless the plant is supposed to have yellow/golden leaves, such as some hostas and heucheras. Eyes are immediately drawn to yellow and jaundice quickly comes to mind. Keep insect repellents handy. Whiners dodging and swatting bugs are as odious as buzzing gnats or mosquitoes. Use fresh flowers in simple centerpieces. A single rose blossom floating in a clear glass cup, better yet several in a bowl, suffice. Accompany the blooms with a few floating candles if you like. Florist flowers are OK, particularly if garden blooms are sparse. 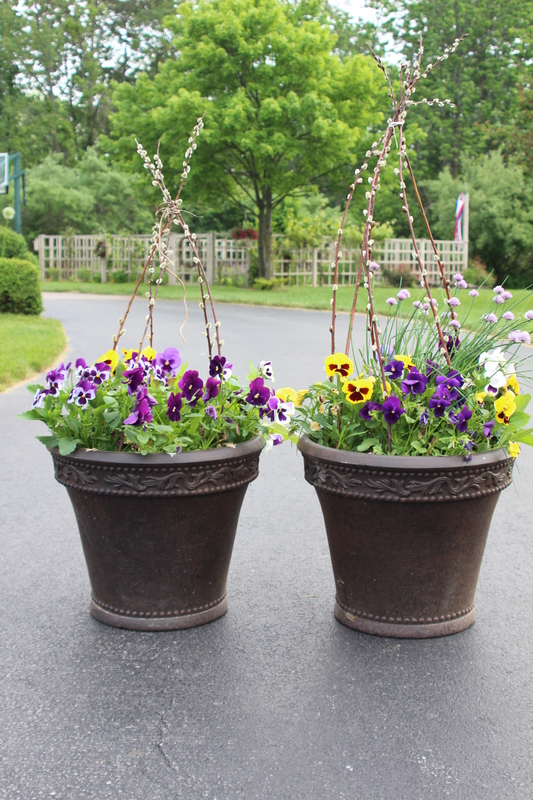 Add some festive, flowery containers at your entry area, party scene and other strategic points if budget allows. 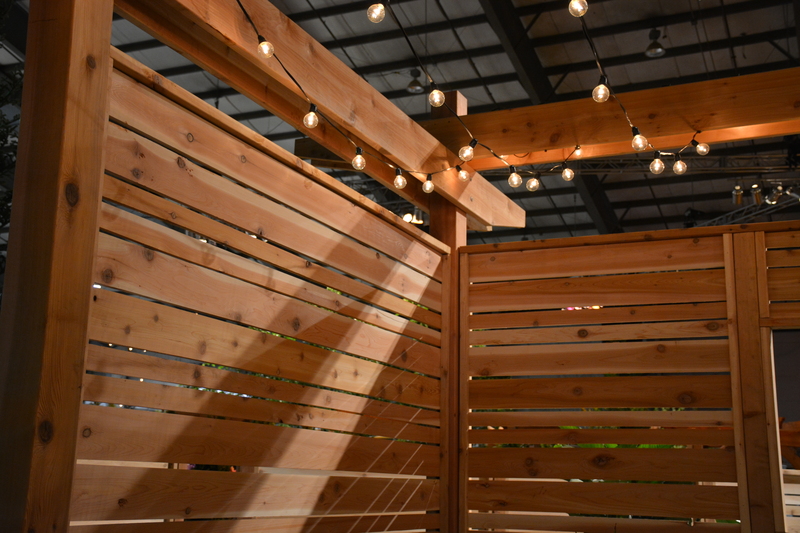 Create a party atmosphere by stringing white or colored Christmas lights under the patio umbrella, along the porch rafters, around the deck railing, upon shrub branches and other places time and plugs allow. Keep cords from becoming tripping hazards. Be warned: You may like the lights so much, they become permanent fixtures. Nothing wrong with having romantic ambience on a week night and pretending you’re sipping a sophisticated something in a Fred and Ginger flick.